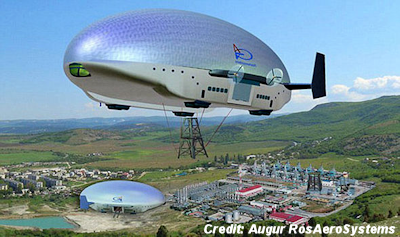 RUSSIA is set to unveil a top secret spaceship-like aircraft that promises to be "lighter than air" in the latest warmongering exercise by Vladimir Putin. Work is already underway on the hi-tech 130-metre-long Atlant, which is to be created by merging technology from planes, hovercraft and airships. Capable of taking off and landing without a runway it will be able to carry 200 military personnel at speeds of up to 105mph. The futuristic craft is equipped with sophisticated high-precision computer technology, with Russian officials claiming that the $15million (£9.5million) aircraft will be used by the Defence Ministry. The company behind the 21st century model, Augur RosAeroSystems, say Putin's new toy will be ready for use by the army as early as 2018 . . ..